Blog | Why does a garage door break down? Why does a garage door break down? Have you heard creaking noises whenever your garage door opens? Is it taking a while to open or close? If so, better not leave these signs unattended. If you don’t fix the door soon enough, it might not open at all. Now, what are the signs to look out for when it is about to break down? 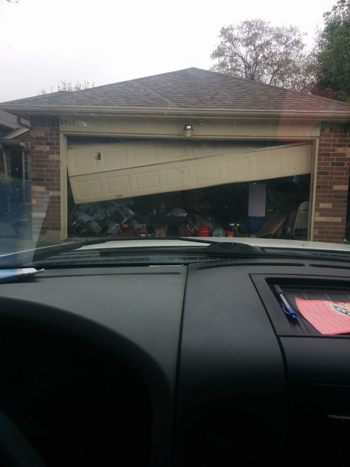 One possibility is that one of the garage door torsion springs may be broken. The result is that the motor is no longer capable of raising the door. These springs are one of the components that aid in lifting the door. What you should know is that they only have a limited number of cycles (or lifespan). If you notice this defect, do not attempt to open the door at all. It would be better to get the broken spring replaced first. Another possibility is that the operator is not receiving enough power. First, you have to make sure that it is plugged in to a functioning outlet. If it still does not work, you can get in touch with one of our specialists to take a look at your electric operators. Another common cause of a garage door breakdown is bent garage door tracks. If you notice this, again, do not attempt to open the door. It is better if the track is replaced first. Once the new one is in place, you can add some impact guards so that it can withstand minor collisions. In addition, make sure to have it cleaned regularly to get rid of any debris, grime, and dirt. Afterwards, it should be well lubricated so that the rollers can move smoothly. Lastly, you might have installed the wrong type of components for your door. Before you purchase any replacements, make sure you know the correct specs first. You can consult with one of our specialists to give you an idea on the correct parts.